Away from Montclair’s bustling Bloomfield Avenue resides Adara, perhaps New Jersey’s first ‘real’ molecular gastronomy restaurant. This epicurean haven offers a contemporary space, stellar service and outstanding food it dubs “Modernist” in style. Art Institute of New York City graduate and ACF certified Master Chef, Tre Ghoshal, has extensive experience working under Chef Joe Bastianich and as the executive chef at The Rotunda, at Neiman Marcus in Paramus, NJ, The Savoy Grille in Newark, NJ, Nouveau Sushi in Montclair, NJ and as chef de cuisine at The Eureka Inn, Eureka, CA. 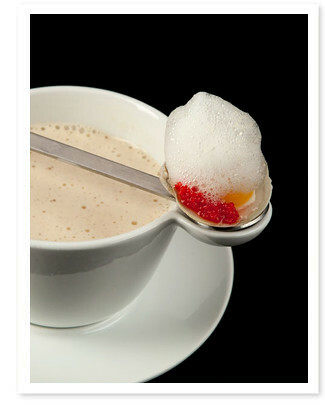 His creative food pays homage to culinary superstars Wylie Dufresne, Grant Achatz and Ferran Adrià. The menu offers a la carte options and the popular 3-course ($65), 5-course ($85) and 7-course ($110) prix fixe tour menus. For those looking for a complete voyage through Adara’s menu, there is also the grand tour, inviting patrons to savor 12 inventive courses ($175). General Manager, Philip Dowling, or members of the attentive staff, enthusiastically guide guests through the exciting menu to help create the right experience for them. On a recent visit, our party opted for the 5-course menu that featured such dishes as the New England Clam Chowder – a bowl of complex flavors served with quail egg, masago, maple pancetta and tasty foam that Adara calls “deep sea wind”, the Campania – chef Ghoshal’s version of Caprese salad with vine ripe tomatoes, a mozzarella ‘balloon’, an extra virgin olive oil sorbet and basil, the White Truffle Envelope – a Hudson Valley foie gras-filled raviolo served with kumquat mostarda, cappuccino and pistachio, and the Lobster in a Veil – served with uni, celery root and Bengal curry. One dish is better than the next and creates a kid-in-a-candy-store feeling among diners. Adara is a BYO, representing an affordable opportunity for guests to bring special bottles from their wine cellars to pair with the eclectic food. Stemware is of the best quality, enhancing the experience. Adara might just be the new crown jewel of an already star-studded restaurant lineup in Montclair. It is a must-try for anyone interested in creative, flavor-packed and gorgeous food, without the schlep to Manhattan. 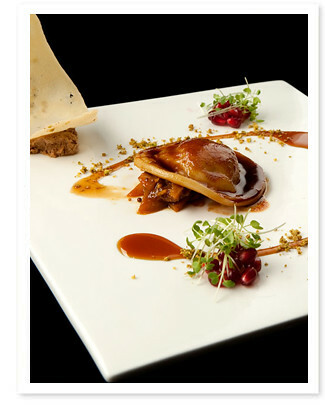 A meal at Adara will prove to be an unforgettable dining experience for even the most discerning food enthusiasts. Reservations can be made by phone at 973.783.0462 or via Open Table. Reservations are required by 4PM of the previous business day for the 5, 7, and 12-course tour menus. Adara is participating in Montclair Restaurant Week with a $31, 3-course menu.